Guardian Avionics Unveils smartPlane System – an iPad-Based Multifunction Display & Flight Data Recorder with AHRS and Voice Command Capability – an MFD for Under $1000 for Your FAA Certified Aircraft! Black Friday Savings for Safer Winter Flying! Lycoming Engines has released a Service Bulletin (SB 627C) for the Lycoming Engine Model TIO-540-AJ1A affecting primarily Cessna T206 Stationair aircraft requiring exhaust system inspections in response to field reports of exhaust leaks due to cracked welds and exhaust studs pulling from a cylinder on the engine. Lycoming is requiring an initial exhaust system inspection within 10 flight hours of the date of the Service Bulletin (November 17, 2016) and inspections and torque checks at intervals after the original inspection. 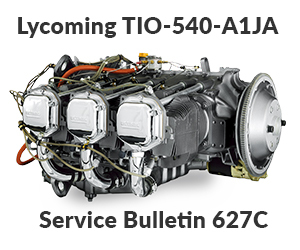 Read the full text of Lycoming Engine Service Bulletin 627C for Model TIO-540-AJ1A at this link. For aircraft equipped with an operating electrochemical carbon monoxide (CO) detector with a lower alarm threshold of 50 PPM, the exhaust system inspection interval for engines with less than 1000 hours of time in service is set at every 50 hours instead of every 25 hours for aircraft without a CO detector. The Guardian Avionics Aero 452 is an electrochemical CO Detector that meets the requirements of the SB 627C and has a lower alarm threshold of 50 PPM. All Cessna T206 models from 2007 onward have either the 452-201-006 or 452-201-010 CO detectors installed as standard equipment. All Aero 452 models have a seven (7) year time before overhaul for the CO sensor as outlined in the Instructions for Continued Airworthiness, so any Aero 452 CO detectors in aircraft built earlier than 2010 that have not had their CO detector serviced must have their units sent in to Guardian Avionics for overhaul to remain in compliance with the Service Bulletin. Any aircraft model year 2011 and newer should plan to send in their CO detector for overhaul when passing six years of service life. For instructions on sending a 452-201-006 or 452-201-010 in for service and overhaul, please visit this link. If you are operating an aircraft with a Lycoming Model TIO-540-AJ1A that does not have a Carbon Monoxide detector installed, the Aero 452-101-011 panel mounted CO detector or Aero 452-201-011 remote mounted CO detector are TSO certified units that meet the specifications of the service bulletin and may be installed by a avionics technician or A&P mechanic.